A little treasure from the plant swap, Starfish cactus. Earlier this month I blogged about the Heights Garden Club plant and seed swap. I came home with two interesting cuttings brought by my fellow steering committee member Dee. I later got the names from her. 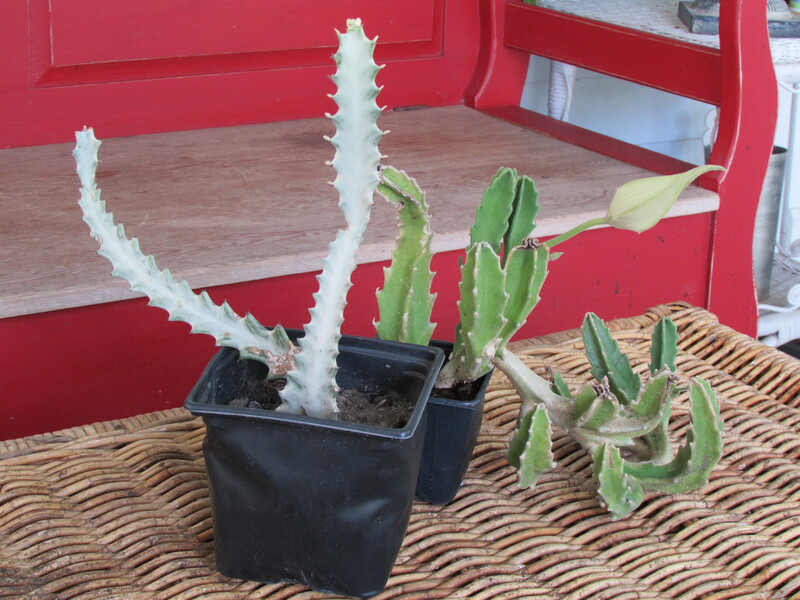 One was a White Ghost Candelabra, Euphorbia lactea ‘White Ghost’ and a darling little called Starfish Flower or Starfish cactus, Stapelia grandiflora. Neither are actually in the cacti family. 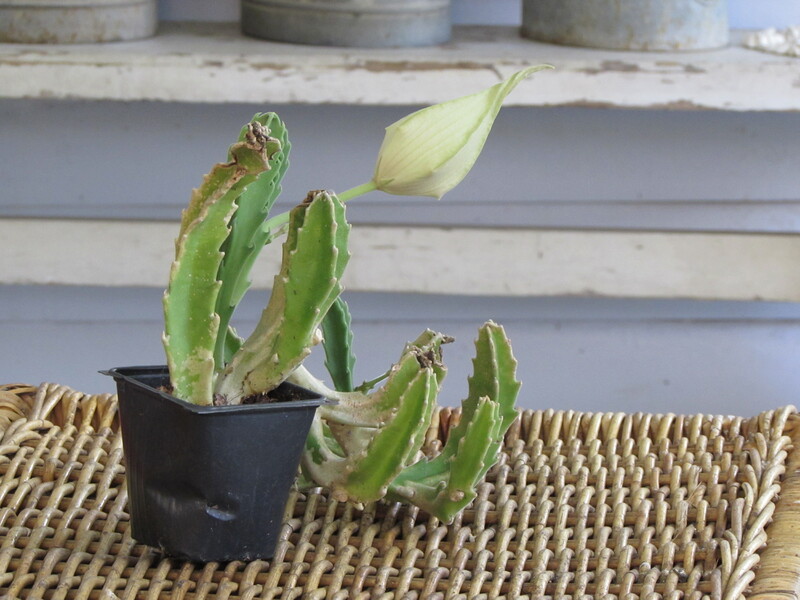 While waiting for pots the Starfish cactus produced a bloom. I did some more research on the Starfish cactus also called a Carrion Plant because it emits an odor from the flowers as a way to attracting flies in areas where other pollinating insects are scares. I guess it is just as well I have mine outside. Here you see the flower is still full of ridges. 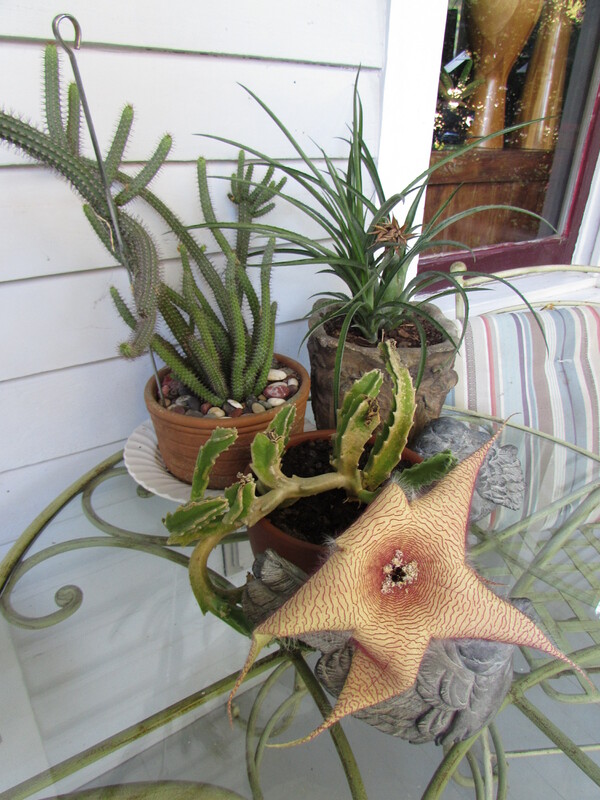 This plant species is native to South Africa, so growing Starfish cactus usually requires a warm climate (zone 9-11) and it likes humidity, not a problem here! I will have to bring this one in during part of the winter. 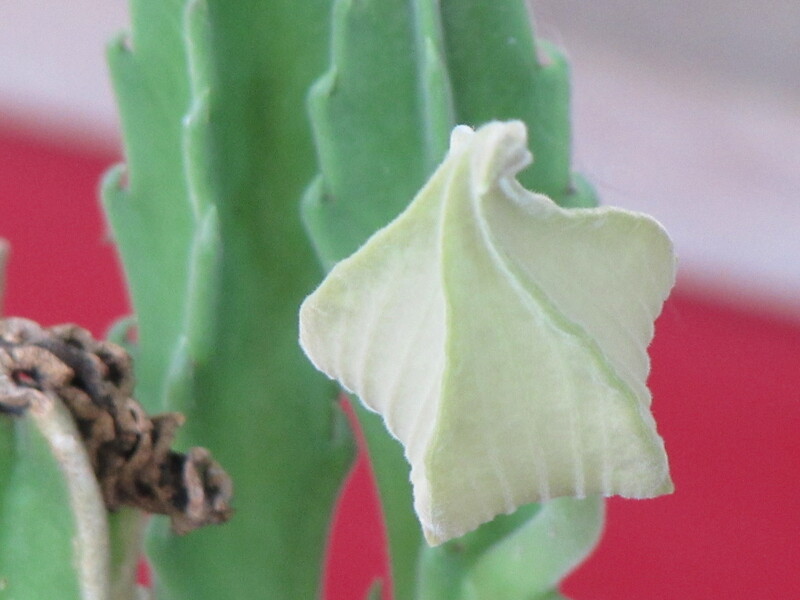 It is said to prefer full sun and well drained soil like most cacti and succulents. It doesn’t need fertilizer but I did used seaweed extract drench for transplanting shock. Still waiting for a pot but putting lots of energy in to its bloom. Every few days I would take another picture not knowing how long it takes to open. It is said to be easy to propagate from cuttings. Take a sharp knife and slice off one of the branches and rooting it in moist soil. Starfish cactus are actually members of the succulent group of plants. They are soft stemmed plants without spines, which spread out from a central point. These are thickly skinned and said to resemble carrion flesh. About a week ago we finally found a pot for our new porch plants. In my research I read that Starfish cactus like to have crowded roots and it suggested its best to keep them in a 4- to 6-inch deep pot. I used succulent soil and a terracotta pot that will not hold too much moisture. I put it on the glass table just outside our office window so I could keep a close eye on it. And on Saturday it finally opened. I had to use one of the bird statues to prop it up it was so heavy. It is a summer bloomer and the flowers can get up to 10″ across and most varieties have reddish insides, perhaps to further the suggestion of being flesh. Still doing fine on Sunday! Flop! I did read they only last a few days : ( but I am sad to see it go. I noticed small insects crawling inside but the smell wasn’t all the bad. I see little buds that might turn into blooms we will see! Wow, what a glorious bloom! I’ve never seen one in person but your photographs are wonderful! Aren’t plant swaps great? Glad you got this and hope it does well for you! It is a fun plant Peter, you need to get one for your collection : ) This was our garden clubs 1st plant swap and it was so much fun we are making it an annual event each August, when it is too hot for an outdoor garden tour! 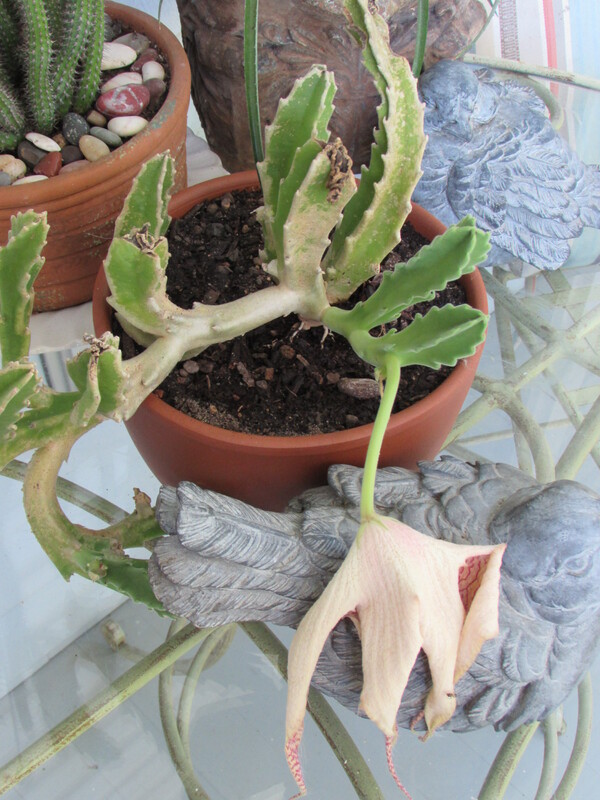 Lovely to see someone else has Stapelia gigantea.I enjoyed seeing your flower. A friend brought me a cutting of hers from Martinique 4 years ago and it has 2 buds at last. I can’ t wait for it to bloom. 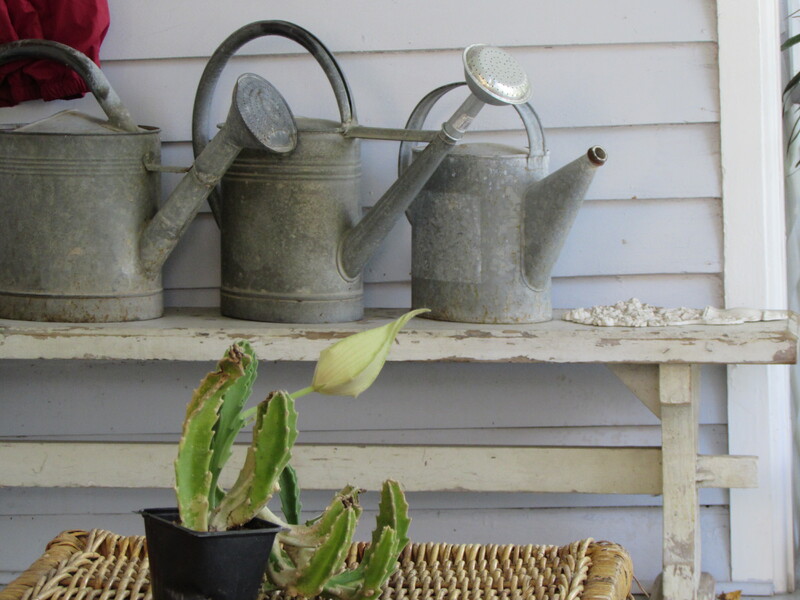 I like your watering can collection. They look nice displayed. White Ghost is interesting and in a way looks sick, even though that is what it is supposed to look like. I like the cactus, but never grew them. It must take a lot of patience to grow them. The watering cans are fun and I do use them : ) As to patience…I don’t have any expectations so I am fine to just let them do there thing. I have a whole garden full of plants and my porch is saved for the more unusual ones that intrigue me. 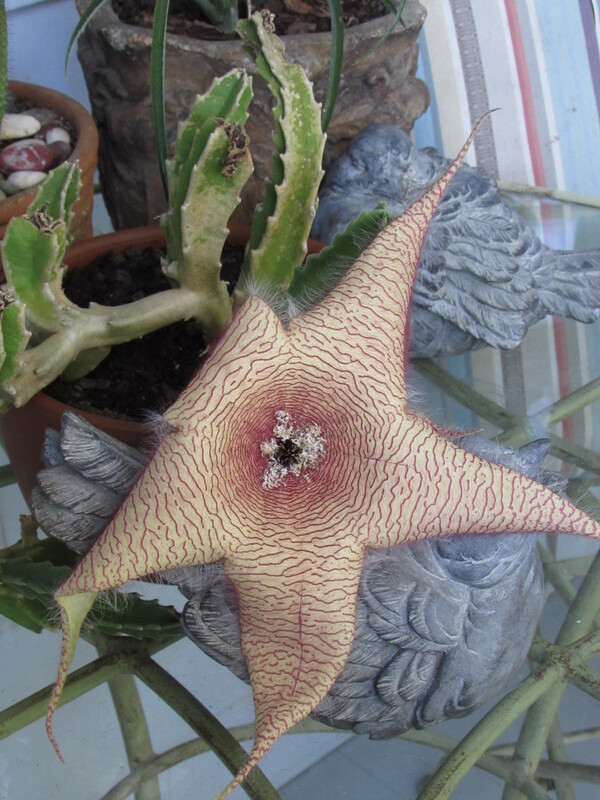 I’ve always called this carrion flower, but starfish flower is much nicer. Mine is smelly and attracts flies. I’ve only smelled it once and that was enough. I had mine for years before it bloomed because I always kept it in the shade. It can actually take a fair amount of sun even in a container. The more sun you can give it, the more it will bloom. Mine has bloomed several times this year and more blooms are forming. I did find it called that too! Mine is still crawling with bugs…maybe it has gotten smellier : ) I will see about getting mine more sun, right now it gets late afternoon sun on the porch. I’m not sure I’d be able to sneak a ‘carrion flower’ into the house, I think the plant police would catch on, lol, but the ghost is cool, and I would love to find that one! Glad you are still enjoying the plant swap. Hi Bittster, They only smell when they flower : ) and I didn’t find it all that bad. I do think they prefer to be outside during the warm weather. I was going to ask if it was stinky, but I see others have already mentioned that quality. You didn’t notice anything…fragrant? 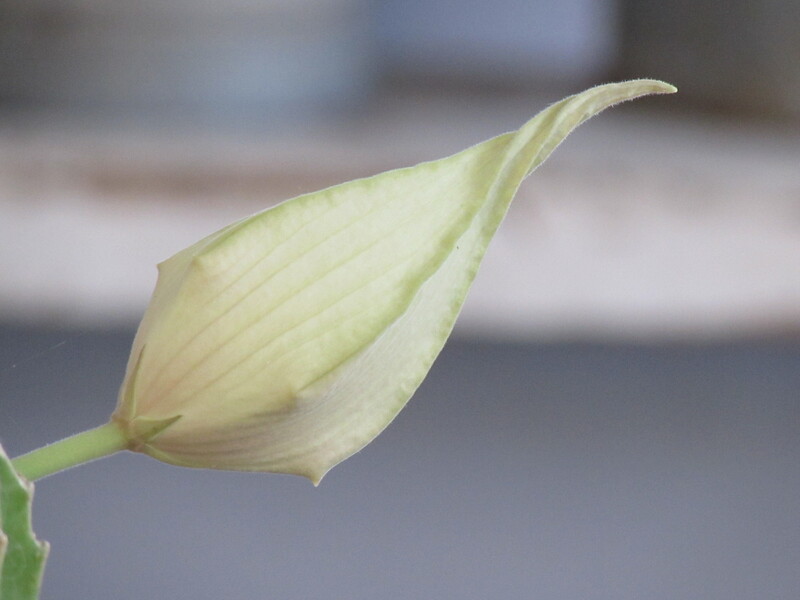 It’s certainly a dramatic and fascinating flower.